There's something new learned every day! It's so true! I've been enjoying the "Monarch Butterflies" as they gracefully fly in and then land on the vibrant colorful Zinnias that I planted late this spring - from seeds. My Hubby & I have noticed that the center of the butterflies are not as vibrant as we believed they usually are. That prompted him to send an e-mail to Magic Wings Butterfly Conservatory & Gardens in South Deerfield, MA inquiring why this was the case. The very kind folks at this very popular tourist destination located about an hour north of us sent back the explanation. The butterflies that are enjoying our gardens filled with brightly colored flowers, perhaps as much as we do, are not Monarchs. They are Painted Lady Butterflies. 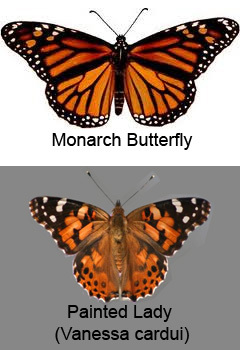 The Painted Lady Butterfly (Vanessa cardui) looks very similar to a Monarch Butterfly, but the thorax and abdomen are paler in color. Beginning last weekend our weather has been ideal! Spending time outside is just the best! 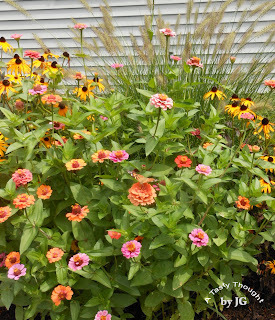 Any time I am driving/walking back home or just walking around our yard the brightly colored Zinnias that are surrounded by other flowers...are blossoming! 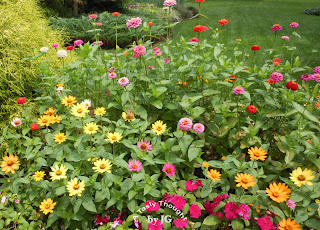 The Zinnias were started from seed, again this spring - three different sizes. However, this year new seeds were purchased. An added plus to their presence is that the Monarch Butterflies are attracted to these gorgeous flowers on any side of our yard. Again this year (as in the past) during the fall season, I'll save the Zinnia seeds, dry and store them to plant next spring. 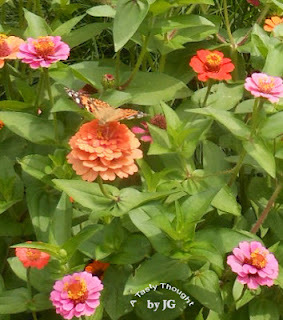 The Butterflies that enjoy our Zinnias are Painted Lady Butterflies, not Monarch Butterflies. See Post "The Painted Lady" on August 28, 2012. The local peaches had just ripened and the Certo was purchased...about 2 months ago. The 1 cup Ziploc Freezer containers and the sugar, also were ready to go. Peach Freezer Jam is the last jam of the trio to find its place on the top shelf in our freezer. Yum! Each package of Certo contains the directions. The directions must be followed exactly. We all take a short cut here and another there while cooking, but when making Freezer Jam, definitely follow the directions. By doing so there will be no disappointments. After the 24 hour time period had ended...into the freezer the Freezer Jam went! I do find that one batch of the peach flavored jam can yield 1-2 more 1 cup containers than the directions state. Sometimes, the extra 1/2 cup jam is poured into a custard cup and covered with foil to wait out the 24 hours with the other containers. The custard cup of jam is refrigerated and enjoyed during the week. Click here for more helpful hints. Freezer Jam is absolutely delicious! As you can tell, I'm not partial whatsoever to the commercially produced jams/jellies that are sold in the supermarkets. It's wonderful to have pieces of fruit visible in jams that taste great! Do you make Freezer Jam? It's easy to make and tastes sooo goood! Fresh Eggplant! Mmmm! A large fresh Eggplant is even better! I definitely had plans for the veggie as soon as I caught a glimpse of it at the road side stand. Suddenly, I remembered the rather thin tomato sauces that can be purchased for pasta toppings. It was time for my West Bend Slow Cooker to do its thing. Every so often a delicious, nutritious dinner containing tomato sauce really hits the spot. Eggplant Meat Sauce! If you have a stocked food pantry, as I do, the needed canned goods are a few steps away. A zucchini and a handful of fresh spinach were in the fridge. If I did not have these veggies, but a fresh green pepper was in my crisper, I'd use that instead. You get the picture - this sauce never is prepped using the same exact ingredients. It's great! This hearty sauce was served over penne. Yes, there were more servings left after dinner. You guessed it! Ziploc Freezer containers were packed and labelled/dated and found their place in our large freezer - after the sauce cooled. In the colder months a few dinners will take only a few minutes to prepare. 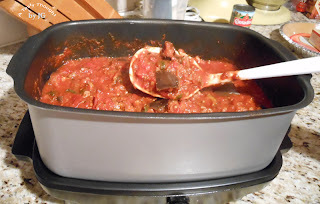 **My Slow Cooker's removable pot has a nonstick coating. I still spray it lightly with PAM. I also always place a veggie (in this scenario I had some cooked pasta) on the bottom. Usually in a Slow Cooker/Crock Pot the meat/chicken is placed on the bottom. For me it's the second food to go in. This eliminates any slightly dry meat on the bottom. (1) large Eggplant - Cut into slices and then cut each slice in 6 pieces. Add sliced Zucchini & Eggplant pieces. 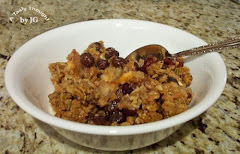 Using a Slow Cooker/Crock Pot during these HHH days of summer is wonderful! They had been sitting in the veggie crisper. What was I waiting for you might ask?!? Waiting for the weather to cool off a bit - so I could prepare the Beets for dinner one evening. That opportunity did happen last weekend! Fresh Beets taste so good! 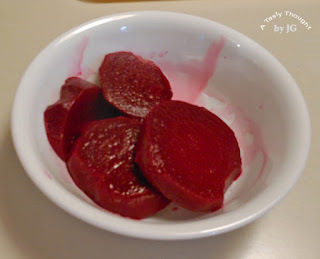 For me it was still too hot to preheat my oven and roast the Beets, so I cooked them the way my family always enjoyed this veggie while I was growing up. They simmered on the stove for 45 minutes. This was an "oldie but goody". While growing up my family had 2 large gardens and our veggies were picked from the garden and prepared whenever we wanted them in the summer. 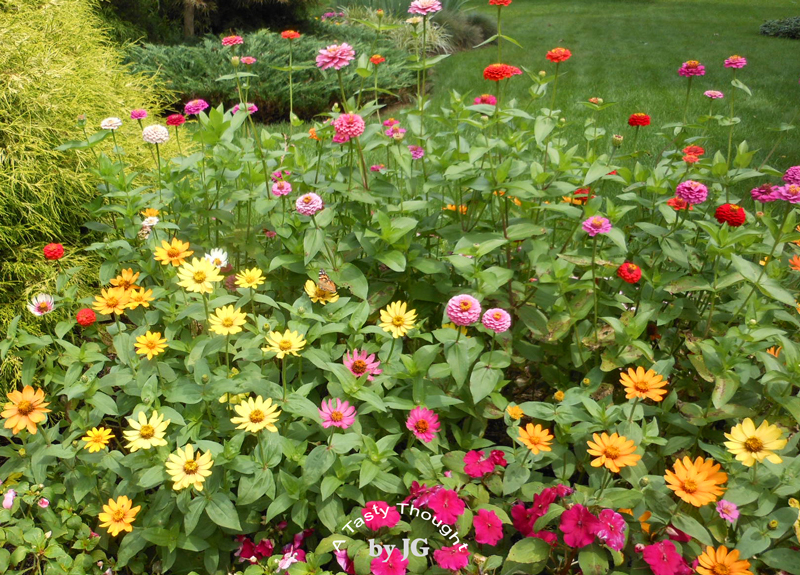 Now, I have perennial flower gardens and live in another area in the beautiful state of MA. Fresh Beets are so good! No butter/margarine is needed! Yum! The Beet greens were cut off leaving 1" of the top. Then, wash in cold running water using a veggie brush. The 6 Beets were placed in a large pot and covered with cold water. Heat water to boiling and continue on a low boil for 45 - 50 minutes. After the time, remove from hot water and cool slightly on plate. When cool enough to handle, cut off bottom and the Beet skin will peel off. **The Beet juice can stain, so I place a small piece of foil under the plate while peeling/slicing them. We did have a few extra slices and according to "family tradition" they were placed in a container and covered with vinegar. The covered container was refrigerated and the next evening we enjoyed cold Beets with a little pizazz! Learning while having FuN is the best way to learn! There are 5 more Fridays in the very generous gift from the Highland Street Foundation to residents who live in or tourists visiting Massachusetts! Throughout the state there are specific places listed for each Friday this summer where there is FREE ADMISSION for visitors of all ages. From the Berkshires to the Cape we have so many beautiful and family oriented places to visit. If you have a Friday vacation day and are searching for a FuN family activity before school starts, check out the link for scheduled list of places to visit. 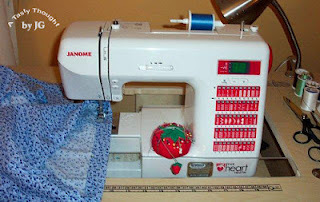 This is a wonderful summer program! 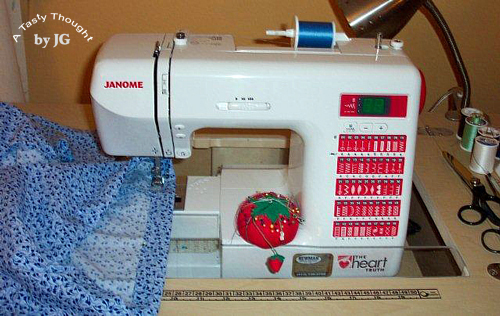 You just might learn something new while having FuN!